The scanning electron microscope (SEM) uses a beam of electrons to produce an image of the specimen. Due to the higher wavelength of electrons, compared to light, the resolving power of the EM is much greater making it capable of much higher magnification. This allows researchers to see much smaller objects in finer detail. 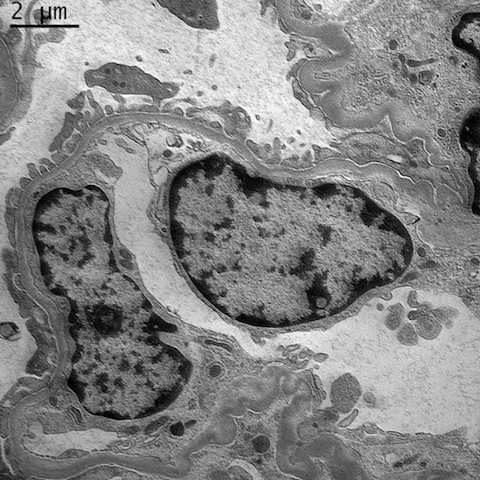 The high magnification of the electron microscope enables observations not possible by light microscopy, and electron microscopy is considered to be an essential component of human diagnostic renal pathology. Ultrastructural features may enable a diagnosis to be made where the light microscopy is apparently normal, for example minimal change, thin membrane disease, hereditary nephropathy, and fibrillary and immunotactoid glomerulonephritis. In addition, it can provide information to confirm or elucidate a diagnosis, as in immune complex glomerulonephritis, renal amyloidosis, dense deposit disease, and diabetes. When samples for electron microscopy are inadequate, valuable diagnostic information can be obtained from ultrastructural investigations on reprocessed paraffin- embedded or frozen material. The SEM is a FEI FEG-Nova NanoSem, the latest microscopy technology. It can be used to generate images of surface topography and determine chemical composition at very high resolutions. Capabilities include EBSD, EDX, and in situ heating and straining. Samples must be free of dust and electrically conductive, but may be any geometry or shape. It is located offsite at the Queen’s Radioactive Materials Testing Laboratory off HWY 401, in Kingston.